Rate compensated heat detectors are designed to initiate an alarm when the temperature of the surrounding air reaches a predetermined level, regardless of the rate of temperature rise. 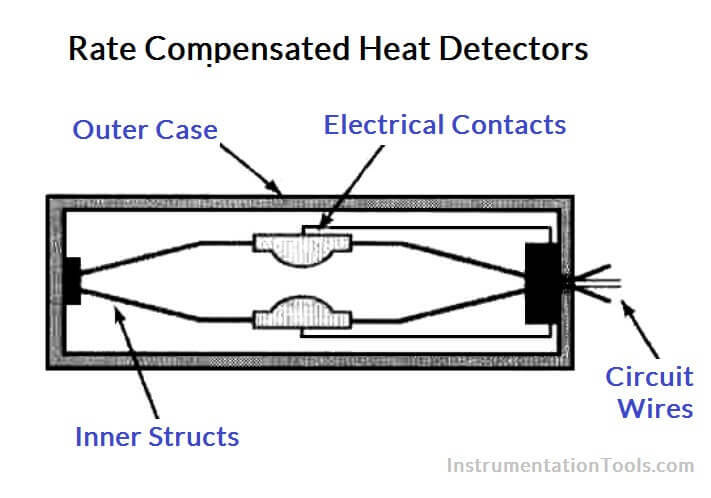 Rate-compensated heat or thermal detectors are devices that are designed to activate at a predetermined temperature in a space regardless of the rate at which the temperature in the space increases. This is accomplished by compensating for the thermal lag between the room temperature and the interior of the device. Construction consists of an outer metal tube that expands at a fixed rate. Within this tube, alarm contacts close when a certain expansion distance is reached, but this expansion is opposed by another metal device. At a slow rate-of-rise in temperature, the outer tube expands drawing the contacts closer together. The inner metal device exerts a counter force, keeping the contacts separated until the entire device has been heated to its rated temperature. At a rapid rate-of-rise in temperature, the outer tube expands faster than the inner device can compensate. Therefore, the alarm contacts close when the entire device has been heated to a lower level, thus compensating for thermal lag. These detectors are designed to eliminate the thermal lag associated with a fixed temperature detector as well as the problem of false alarms and the risk of missing slow heat release combustion that are inherent with rate-of-rise detectors.